The first Barefoot Bloggers recipe this month was chosen by Tonya of What's on My Plate? She chose Ina's Individual Meatloaves. I can't say that I was super excited to make them, as I already have a favorite meatloaf recipe, but I gave them a shot. I'm so glad I did, because they were easy to throw together, and totally delicious! I made half the recipe, but now I wish I had made the whole thing. The leftovers made great sandwiches the next day - I highly recommend toasting slices on some crusty bread with a slice of provolone on top. I stayed true to the recipe for the meatloaves, but I used Cook's Illustrated's recipe for the glaze. 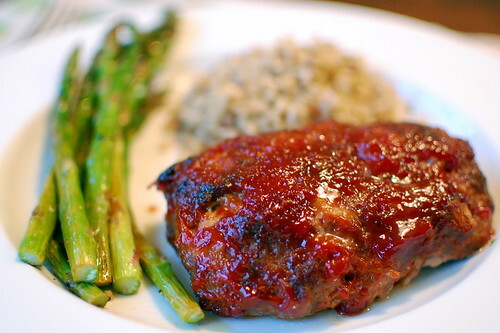 To me, the glaze makes the meatloaf, and this one can't be beat! I also used their method of cooking the meatloaves on a wire rack set atop a baking sheet, allowing the rendered fat to drain onto the baking sheet. Thank you Tonya, for yet another Ina success! Preheat the oven to 350. Wrap a wire rack with aluminum foil, and poke holes with a skewer or fork. Set atop a baking sheet. Heat oil in a skillet. Add the onion, garlic, salt, pepper, and thyme, and cook until softened and translucent,but not browned, about 8 minutes. Remove from heat and stir in the Worcestershire sauce, chicken broth, and tomato paste. Crumble the ground beef into a mixing bowl, and add the onion mixture, breadcrumbs, and eggs. Lightly combine using a fork, being careful not to mash the mixture. This will keep the meatloaves from being dense and tough. Divide the mixture into six 10-11 ounce portions, and shape each into a loaf. Line them on the baking sheet. At this point they can be refrigerated for several hourse, or frozen. Bake 25-30 minutes, or until they reach 140 degrees on an instant-read thermometer. Meanwhile, combine the ketchup, hot sauce, vinegar, brown sugar, and coriander in a small saucepan. Bring to a boil, and cook until the glaze is thick and syrupy, about 5 minutes. Using half the glaze, brush the tops and sides of each meatloaf. Allow to cook an additional 5-10 minutes, or until they reach 150-155 degrees. Brush with remaining glaze, and place under broiler. Broil an additional 5-10 minutes, and remove from oven. Yum! I've been wanting to find a good meatloaf glaze, so I'll be trying this one! Your meatloaf looks absolutely beautiful. Did you like this more or less than the recipe you usually use? I've maid Ina's meatloaf before, and I liked it, too. I must try out this glaze. I though these were delicious, too. I don't have a favorite recipe for meatloaf, so I guess this is it! I will have to try the glaze recipe from CI, it sounds yummy. I usually use CI's recipe for meatloaf. I'd have a hard time choosing between them quite honestly. CI's requires a lot more prep, and Ina's is definitely easier and faster. So I guess it just depends on what you're looking for! 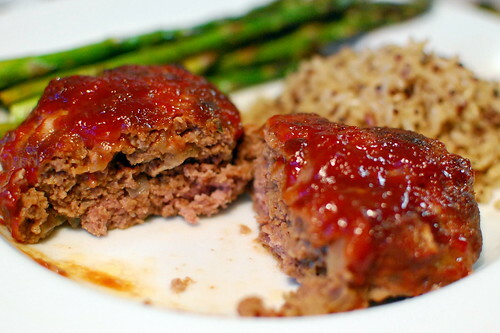 Mini meatloaves, that's such a great idea! Can't wait to try out the recipe, thanks! I made this tonight for my husband and myself (1/2 portion). It was so delicious. No leftovers! I tried the recipe for the grandkids and it was a hit. Another great thing you can try is scooping the meat mixture with an ice cream scoop into large muffin tins. My mom and I do this with both beef and turkey meatloaves. I hardly ever make meatloaves that aren't in the muffin tins because I enjoy how crispy the tops get. Try it sometime because I think you'll like it too! I found there to be WAY too many onions. I love onions, but it looked like more onion than meat. Also, unless you are making these for people who eat large quantities of meat they are really too big to be individual. A serving of meat should be between 4-6 oz. It's very good, a winner for sure, but those were my findings upon making this recipe.